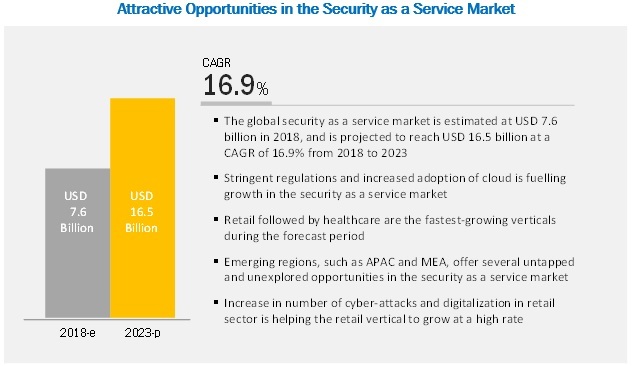 [158 Pages Report] The security as a service market is expected to grow from USD 7.6 billion in 2018 to USD 16.5 billion by 2023, at a Compound Annual Growth Rate (CAGR) of 16.9% during the forecast period. The mandate to follow regulatory and data protection laws, high cost and risks in managing on-premises security solutions, and increase in demand for cloud-based security solutions are the main drivers of the market. The market is segmented by component (solutions and services), application area, organization size, vertical, and region. The market by solution includes business continuity and disaster recovery, continuous monitoring, Data Loss Prevention (DLP), encryption, Identity and Access Management (IAM), intrusion management, Security Information and Event Management (SIEM), vulnerability scanning, and others. The SIEM segment in the security as a service solution market is expected to have the largest market size, during the forecast period. 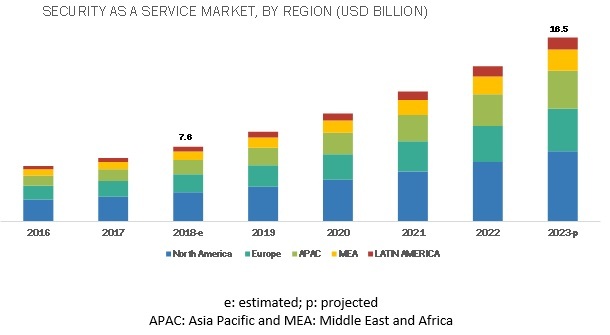 The market for services segment is growing as the individuals, Small and Medium-sized Enterprises (SMEs), and large enterprises are concerned about securing access to their network, endpoint, cloud, and applications. The support and maintenance services segment is expected to have the highest market share due to the need to solve any technical issue and avoid breakdown time. 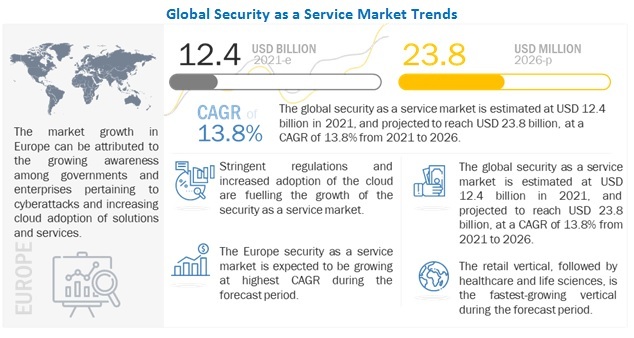 The security as a service market study aims at estimating the market size and future growth potential of the market across segments, such as components (solutions and services), application areas, organization sizes, verticals, and regions. Network security is a proactive technique for securing a network from advanced threats by collecting and analyzing different types of network security event information. With the increasing threat landscape, the demand for cloud-based security solutions for network security is increasing. It protects the network by restricting the device management accessibility to terminals, authorized services, management ports, and protocols. Organizations adopt a series of policies and cybersecurity cloud services to prevent unauthorized access and misuse of networking resources. The SMEs segment is expected to grow at the highest CAGR during the forecast period, owing to the increasing incidence of cyber-attacks on these enterprises. SMEs are small in terms of their size but cater to a large number of customers globally. Robust and comprehensive security solutions are not implemented in SMEs, due to financial constraints in these organizations. However, the large enterprises segment accounts for the highest share of the security as a service market in 2018. Security as a service solutions and services have been deployed across various industry verticals, including Banking, Financial Services, and Insurance (BFSI); government and defense; retail; healthcare; IT and telecom; energy and utilities; manufacturing; and others. The retail vertical is expected to grow at the highest CAGR during the forecast period while the BFSI vertical is estimated to have the largest market size in 2018. The global market has been segmented on the basis of regions into North America, Europe, APAC, MEA, and Latin America to provide a region-specific analysis in the report. The North American region, followed by Europe, is expected to become the largest revenue-generating region for security as a service solution and service vendors in 2018. Increasing Internet of Things (IoT), cloud adoption, and Bring Your Own Device (BYOD) trend and growing internal and external threats are some of the key factors expected to fuel the growth of the market in North America. The APAC security as a service market is gaining traction as the security as a service solutions provide proactive security measures against evolving cyber-attacks. SMEs as well as large-scale organizations in the APAC region have become more aware of the increasing cybercrimes and have started adopting security as a service solutions and services to combat them. Major vendors that offer security as a service services across the globe are McAfee (US), Trend Micro (Japan), Zscaler (US), International Business Machines Corporation (US), Microsoft (US), Clearswift (UK), Alert Logic (US) Cygilant (US), Barracuda Networks (US), Panda Security (Spain), Stratejm (Canada), Radware (China), Mindsight (US), Sentinel Technologies (US), and Happiest Minds (India). These vendors have adopted different types of organic and inorganic growth strategies, such as new product launches, partnerships and collaborations, and acquisitions, to expand their offerings in the security as a service market. McAfee is one of the leading operators of the world’s largest global market that helps secure its large customer base from Advanced Persistent Threats (APTs) and vulnerabilities. Its key strategy in the market is to develop business-specific solutions and services according to the current scenario of evolving vulnerabilities. It plans to develop new business models and integrate multi-application solutions as a part of its future strategy. Similarly, Trend Micro, another leading security as a service solutions provider, has implemented various strategies to deliver cutting-edge security as a service to global organizations. Various organic and inorganic growth strategies are helping the security as a service vendors to stay ahead in the global security as a service market. In October 2018, IBM launched a new cloud-based community platform, IBM Security Connect, for cybersecurity applications. This AI and ML-based platform is used to help the security teams to identify threats or risks, and improve the efficacy and efficiency of threat detection and response. In October 2018, Zscaler enhanced its Cloud DLP service with inline Exact Data Match (EDM) and native Secure Socket Layer (SSL) inspection. This enhancement would help customers protect their sensitive information against the loss while reducing the number of false positives to near zero. In April 2018, McAfee partnered with Netmagic to offer malware protection services to its Indian customers. These services would provide next-generation server security on a pay-per-use basis to customers of Netmagic through Netmagic’s cloud services. The study involved 4 major activities in estimating the current market size of the security as a service market. Exhaustive secondary research was done to collect information on the market, peer market, and parent market. The next step was to validate these findings, assumptions, and sizing with industry experts across the value chain through primary research. Both top-down and bottom-up approaches were employed to estimate the complete market size. Thereafter, the market breakdown and data triangulation procedures were used to estimate the market size of the market’s segments and subsegments. In the secondary research process, various secondary sources, such as D&B Hoovers, Bloomberg BusinessWeek, and Dun & Bradstreet, have been referred to, for identifying and collecting information for this study. These secondary sources included annual reports; press releases and investor presentations of companies; whitepapers, certified publications, and articles by recognized authors; gold standard and silver standard websites; security technologies Research and Development (R&D) organizations; regulatory bodies; and databases. Various primary sources from both the supply and demand sides of the security as a service market ecosystem were interviewed to obtain qualitative and quantitative information for this study. The primary sources from the supply side included industry experts, such as Chief Executive Officers (CEOs), Vice Presidents (VPs), marketing directors, technology and innovation directors, related key executives from various vendors who provide the security as a service solutions, associated service providers, and system integrators operating in the targeted regions. All possible parameters that affect the market covered in this research study have been accounted for, viewed in extensive detail, verified through primary research, and analyzed to get the final quantitative and qualitative data. McAfee (US), Trend Micro (Japan), Zscaler (US), International Business Machines Corporation (US), Microsoft (US), Clearswift (UK), Alert Logic (US) Cygilant (US), Barracuda Networks (US), Panda Security (Spain), Stratejm (Canada), Radware (China), Mindsight (US), Sentinel Technologies (US), and Happiest Minds (India). This research report categorizes the market based on components, application areas, organization size, verticals, and regions.